Our business is based on serving our community the way we’d serve our own family. Fowle Eyecare Associates is among the more established businesses in Rockford, MI, and we honor this long-standing confidence you’ve placed in us by continuously moving forward in expertise, service and style. From the start, we do our best to provide conveniences through online scheduling and online forms you can download, complete and bring with you to your appointment. As you’re welcomed into our office, you’ll have an opportunity to hand in your patient paperwork or complete it upon your arrival. Our friendly atmosphere offers ample lighting for you to browse the many eyewear options we provide, or relax in one of our two cozy waiting areas. Prior to meeting with your eye doctor, one of our vision technicians will ask about any health concerns you have and conduct preliminary tests with our leading technologies. During your comprehensive eye exam, our knowledgeable, friendly physicians thoroughly gauge your vision health, systemic health and vision prescription. Testing includes refraction and health checks for binocular vision, vision loss and eye health issues due to diabetes, cataracts or dry eyes, etc. Based upon your vision needs, the exam may require your eyes to be dilated. Most patients are safe to drive after having their eyes dilated, so long as they wear sunglasses. 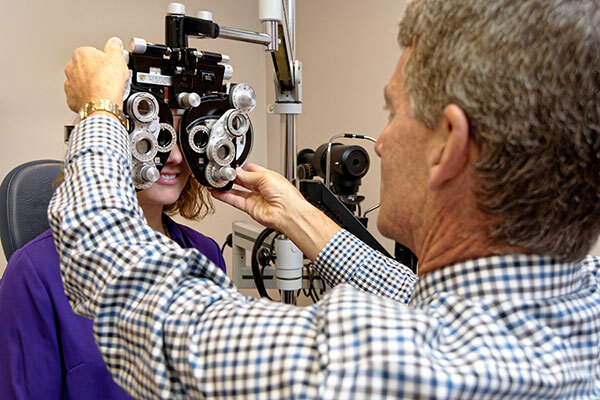 Our eye exam process covers your primary care, preventative care, urgent care and pre- and post-operative care needs. Any loss in vision can be frustrating or even frightening to patients. We understand that and work with you toward achieving your best possible vision. 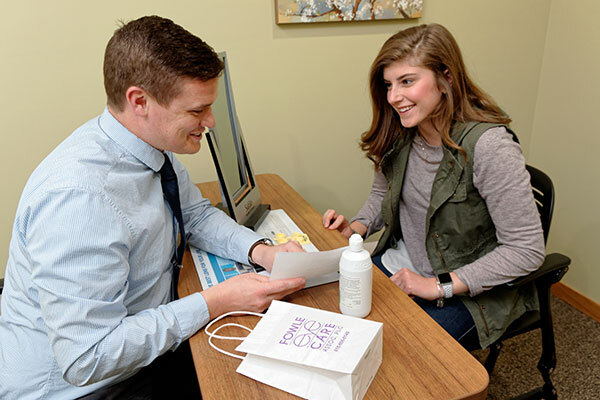 Continuous advancements in preventative eye health and eyewear allow us to bring these benefits to you in the form of soft contact lenses, computer task lenses, scleral contact lenses, sports eyeglasses and more. When you’re dealing with an eye infection or non-surgical eye injury, our care team is on hand to provide the expertise and responsiveness you need. Our doctors are available 24/7 to respond to your urgent, non-surgical eye injuries. Greet the world in eyewear that’s the right fit for your prescription, face shape, daily activities and personality. At Fowle Eyecare Associates, we carry the latest in eyewear, reflecting a variety of shapes, materials, colors, styles and brands. Go on an eyewear exploration with us, bring in your current prescription for a refill or tell us exactly what you’re looking for and we’ll make suggestions for you. Look around our office and you’ll discover eyewear that’s bold, sophisticated, playful, classic, durable, lightweight, comfortable and easy-going. We’ll even connect with our trusted brands online to check on specific colors and styles that catch your eye. Selecting new eyewear should be enjoyable and it’s our job to keep it fun, simple and a smart fit. Our opticians guide your eyewear choices by providing you with optical measurements, your health insurance details, skilled feedback and education about lens options. If you need us to take snapshots of you wearing various eyewear styles, so you can share them with family and friends and get outside feedback, don’t be shy. Also, trial contact lenses also are available for you to sample the care and comfort of that eyewear option, prior to your final purchase. Learn more about our care team.